Where Does David Ortiz Really Rank Among The All-Time Home Run Hitters? David Ortiz hit his 450th home run late last month, moving him to 37th on the career home runs list. There's no doubt Ortiz has had a great career. But his are home runs in an era of home runs—and performance enhancers. He blends into his environment, that is to say. Since home runs were more infrequent in earlier eras, let's see how Ortiz and other recent players stack up on a time-adjusted list. To adjust for different eras, the relative difference of a player's home run rate and those of his peers were compared. For example, throughout his career Ortiz has hit a home run in 5.2 percent of his plate appearances. The MLB average home run rate during Ortiz's career (1997-2014) is 2.7 percent. Taking Ortiz's rate (5.2 percent) divided by the average rate during that time (2.7 percent) gives you 193 percent. Which means Ortiz hits home runs just about twice as often (93 percent more) than his peers. While hitting runs about twice as often as peers is notable, it isn't nearly as impressive as what earlier players did. To no surprise, Babe Ruth is the all-time leader in out home-running peers. Ruth put up modern era home run numbers in a time where only 0.9 percent of plate appearances resulted in home runs. Ruth hit home runs at a rate near 7.5 times greater than his peers. But Ruth was also basically the only player of his era who thought to try to hit home runs with the deliberacy of a modern slugger. He stands out so much because he was ahead of his time physically and tactically, even if he didn't quite realize it himself. Others caught on, as you can see in the early portions of the list, but a big reason that the greatest sluggers of today aren't as much of outliers as Ruth is that the pretty good hitters have wised up to the game. Other legendary Yankees jump when making these adjustments. Lou Gehrig who homered nearly four times as often as his peers jumps from 27 to three. Joe DiMaggio also hit the long ball more than three times often than his peers, moving him from 80th to sixth. At eight, Mark McGwire is the first player on the list to start his career after 1950. Big Mac leads all players in home run frequency, as 7.6 percent of his at bats were home runs, which tripled his peers. Hank Aaron, somewhat surprisingly falls to 16th as he homered 2.57 times as often as his peers. While extending a career can boost total home run numbers and appear favorable on an all-time list, this list is slightly biased against those with long careers. Guys in their 40s generally hit home runs less often than they did in their 20s. So when someone plays 20 plus seasons like Hank Aaron or Cal Ripken, their home run per plate appearance percentage tends to tail off, lowering them on this list. For that same reason, this list also favors current players in their prime. Despite playing during a high home run era, Miguel Cabrera actually moves up on this list (from 66 to 61) because now, during the prime of his career, he's hitting home runs in about 5 percent of plate appearances. If Cabrera plays for another ten years, this rate will likely drop as he ages, moving him further down the list. Ortiz is among elite company with 450 home runs. But if played during an earlier era, he'd have to outhit his peers by a much greater margin to come close to his figures. This list shows that a star before 1960 who hit home runs in 4-5 percent of plate appearances was more superior to his competition than is a modern player who homers in 5-6 percent of plate appearances. While the difference in a percentage point or two don't sound large, they add up over the thousands of plate appearances big leaguers make. A-Rod homers only about 1 percentage point more often than did Joe DiMaggio. But A-Rod has played more seasons and plays more games per season than Joltin' Joe did. Combine these factors, and A-Rod has nearly 300 more home runs than DiMaggio (this difference is greater than the career home runs of Prince Fielder). Rather than assuming A-Rod is nearly twice the power hitter DiMaggio is, a time-adjusted list shows that A-Rod, while great in his own right, produces numbers that are a product of his time. And that what DiMaggio did was in many more impressive given the era and years lost to service. There are other differences across eras, of course. The balls have been wound to varying degrees of tightness over the years, and even within MLB's consistency restraints, there is a lot of room for variance. Pitching has become smarter, and so has the pack of average hitters chasing the great ones. 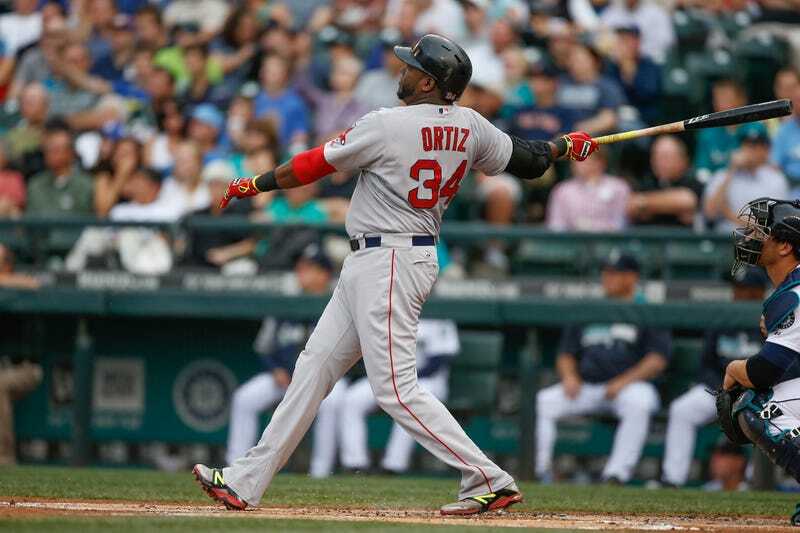 Ortiz is just the 37th player to hit 450 home runs. But 25 of those players started their career after 1980. When put that way, there's less reason to get wood over his long balls.